More than two decades ago on St. Simons Island, novelist George Dawes Green and his friends would gather together on a back porch to share stories and play poker. They called themselves “The Moths,” inspired by insects let in through a hole in the porch screen. When Green later moved to New York City, he missed the evening story swaps and decided to hold one in his apartment’s living room. From there, The Moth was born. 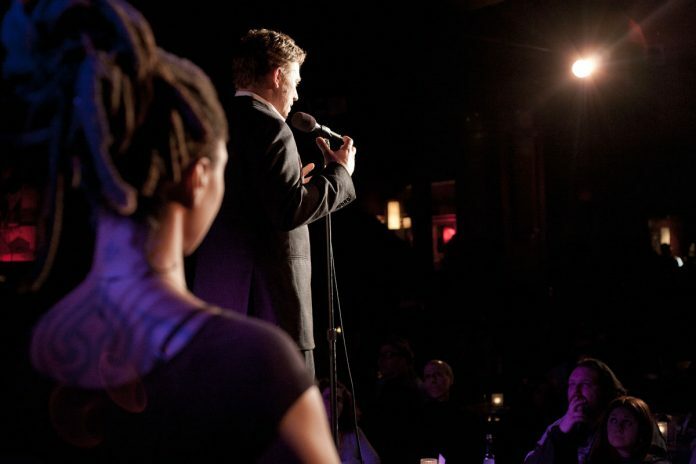 The storytelling program turns 20 on June 6, and since then has spawned not only the popular live Mainstage shows, a public radio show, and a podcast, but educational and corporate programs, two books, and StorySLAMs—open-mic storytelling competitions open to the public. Already in more than 20 cities worldwide, the StorySLAMs will launch in Atlanta this month, with the first show on March 13 at Dad’s Garage. The theme of the evening is “Firsts”—a first kiss, a first job, a first fight—and anyone is welcome to enter for a chance to share their story. Ten names will be drawn, and each participant will have five minutes at the microphone. A panel of judges scores each performance, and a winner is ultimately crowned. Winners from each of the monthly SLAMs will compete in the Atlanta GrandSLAM championship next year. And if you’ve ever dreamed of being featured on the radio show, this could be your chance: The Moth records every SLAM show and has pulled many stories from the competitions. Burns actually got her start with The Moth after winning a StorySLAM in New York in 2002 and competing in the first ever GrandSLAM. She says part of the brilliance of the event is never knowing what type of stories will be told, or who will show up. “They’re really just such fun events. You never know who’s going to walk in,” she says, “We’ve [even] had celebrities show up and throw their name into the hat. Advance tickets for Monday’s 7:30 p.m. show are sold out, but a limited number of tickets will be available at the door. The next show will be April 17—the theme for that night is “Fresh.” Fans can keep up with the schedule on The Moth’s website, and the radio hour airs locally on GPB on Saturdays from 2 to 3 p.m.